20ft Shipping Containers All Grades priced. CBOX Containers SA has a big assortment of NEW and USED shipping containers for SALE or RENT on stock. Containers, Refurbished Inside & Out To the highest quality marine grade & Certified. Storage & Dispatch Containers Great for small home business. Tool & Toy Shed Lock your bits up safe and secure. Transport & placement quotes available. ALL Areas. Did you know you can RENT a container with us for a little price per day! Or would you like a container with additional access to fit all your storage needs? We have DOUBLE END DOOR containers, SIDE ACCESS containers and MINI containers available too! All units are Wind & Water tight and Rat & Vermin proof. Perfect for all your storage and/or transport needs. Delivery options with Tilt tray and HIAB are available state-wide and nationwide. We have a few colours available. Respraying the container is also an option if you need another colour. On request we can install extra vents, whirly birds or a lockbox for you! From time to time there are some cheaper as traded containers available some rusty/leaking/damaged make great lock ups for inside farm sheds or build your own roof. Some are water tight and need other repairs. Modifications Inc. Lock Boxes, Vents, Shelving, Windows, Doors, Lighting & Power to self-contained living. 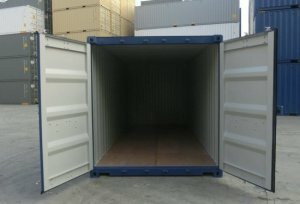 40HC (High Cube) Refurbished Containers. We are a small family business with genuine quality service. Please call and speak to Tony if you have any questions or to discuss your container solution. Thank you for considering our container units & supporting our 100% QLD family small business.